All missionaries, past or present, serve with the hope of making life better for other people. Today’s missionaries carry on the great legacy of filling the earth with the knowledge of the Lord (see Isaiah 11:9). From Abraham to Paul to Ammon to Wilford Woodruff, missionaries in the scriptures and Church history provide modern-day missionaries with strong role models. Whether we are member missionaries, preparing for full-time missionary service, serving a mission, or returning from a mission, we can draw courage and inspiration from these examples. Old Testament missionaries, such as Jonah, were called to deliver a voice of warning to the people (see Ezekiel 3:17–19). From Jonah’s example we see the importance of repentance and obedience. The story of Abraham teaches us about the lineage and power of the Melchizedek Priesthood. New Testament missionaries, such as Peter and Paul, worked to preserve the teachings of Jesus Christ. Nevertheless, over time the world fell into apostasy. 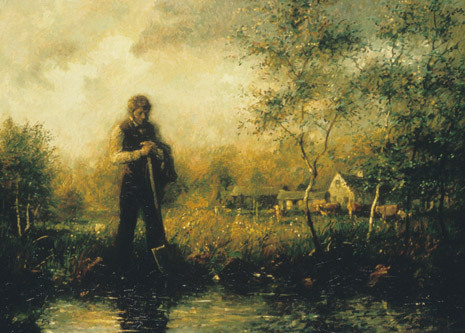 God restored the gospel through the Prophet Joseph Smith. We are now working, as those missionaries did, to preserve and share the teachings of Jesus Christ. President Henry B. Eyring, First Counselor in the First Presidency, “Let Us Raise Our Voice of Warning,” Ensign, Jan. 2009, 3. 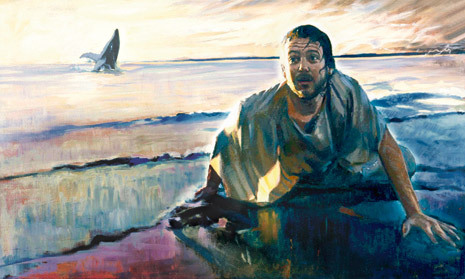 Jonah on the Beach at Nineveh, by Daniel A. Lewis. Jonah repented and went about preaching and confirming that Jehovah reigns everywhere and does not confine His love to a single nation or people (see Jonah 1–4). 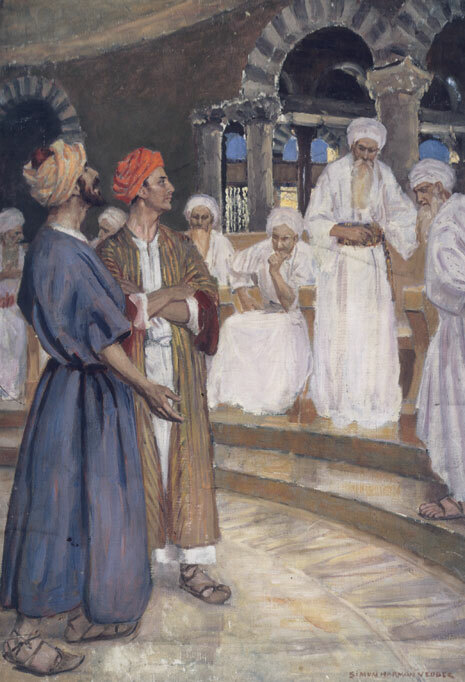 Peter and John before Rulers in Jerusalem, by Simon Vedder. Peter and John were brought before the council, and the high priest asked them, “Did not we straitly command you that ye should not teach in this name? and, behold, ye have filled Jerusalem with your doctrine. … Then Peter … answered and said, We ought to obey God rather than men” (Acts 5:28–29). The Apostle Paul, by Karel Skreta. In his journeys and letters, Paul bore powerful testimony of the Savior throughout Asia Minor and much of the known world at that time. Melchizedek Blesses Abram [Abraham], by Walter Rane. Melchizedek blessed Abram (see Genesis 14:18–20) and also gave him the priesthood (see D&C 84:14). At another time, the Lord appeared to Abram, saying, “I have purposed … to make of thee a minister to bear my name in a strange land. … And thou shalt be a blessing unto thy seed after thee, that in their hands they shall bear this ministry and Priesthood unto all nations” (Abraham 2:6, 9). Alma, Amulek, the sons of Mosiah, and Samuel the Lamanite are only a few of the great missionary role models we find in the Book of Mormon. In them we see examples of repentance, faith, obedience, and courage. Like them, we can rely on inspiration and revelation from God to guide our missionary service. Elder James B. Martino of the Seventy, “Repentance That Brings Conversion,” Ensign, Sept. 2012, 58. Ammon before King Lamoni, by Gary L. Kapp. 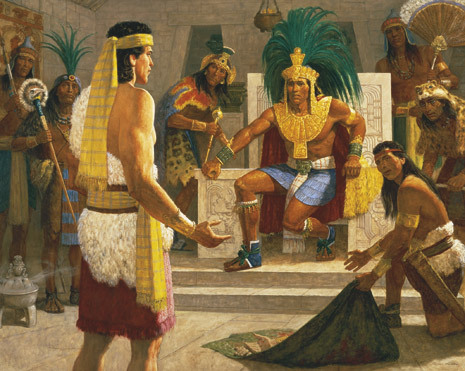 Ammon, one of the sons of Mosiah, saved King Lamoni’s flocks. When the king asked Ammon if he was sent from God, Ammon said that he was a man called by the Holy Spirit to teach the gospel “unto [Lamoni’s] people, that they may be brought to a knowledge of that which is just and true” (Alma 18:34). He Did Bring Glad Tidings to My Soul, by Walter Rane. 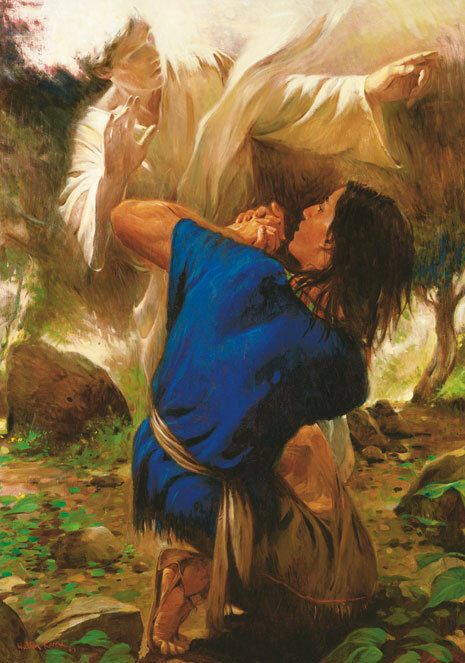 An angel visited Samuel the Lamanite and brought “glad tidings to [Samuel’s] soul” concerning the Savior’s coming (Helaman 13:6–7). As part of his calling to preach to the Nephites, Samuel mounted Zarahemla’s city wall and shared these glad tidings with the people. After the Restoration of the gospel, missionaries were essential. Missionaries such as Dan Jones, Orson Hyde, and Parley P. Pratt shared the Book of Mormon and the gospel of Jesus Christ. Some, like the Prophet Joseph’s brother Samuel, served close to their home. Others traveled far to share the gospel in places such as Thailand, the Sandwich Islands (Hawaii), Denmark, and England. These early missionaries often served long and multiple missions. They left parents, sweethearts, wives, children, and grandchildren just as we do. They serve as examples to us today of faith, courage, obedience, endurance, and diligence. Mormon Preachers, by Arnold Friberg, based on an original by Christen Dalsgaard. 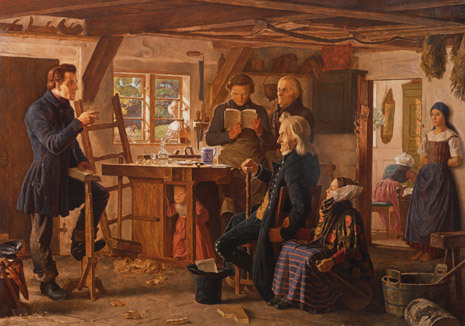 This scene of an early Latter-day Saint missionary teaching the gospel of Jesus Christ to a Danish family gathered in their rural home was typical of 19th-century proselyting efforts. Missionaries also taught on street corners or in town meeting halls. Wilford Woodruff Prepares for Baptisms at Benbow Farm, by Richard A. Murray. The Lord led Wilford Woodruff in the 1840s to John Benbow’s farm in Herefordshire, England. “There was a people there who had been praying for the ancient order of things,” wrote Wilford. 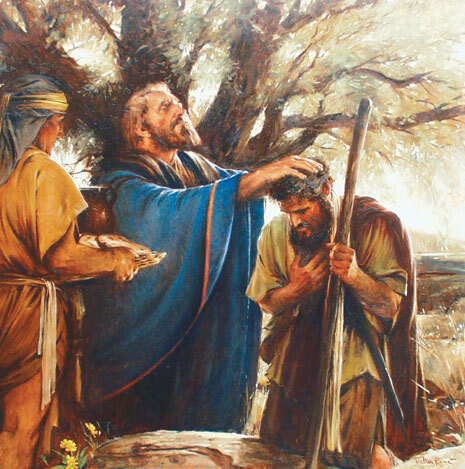 “The consequence was, the first thirty days after I got there I baptized six hundred. … In eight month’s labor in that country I brought eighteen hundred into the Church. Why? Because there was a people prepared for the Gospel” (“Discourse,” Deseret Weekly, Nov. 7, 1896, 643). Since President Thomas S. Monson announced in the October 2012 general conference that young men and young women could leave for a mission at a younger age, tens of thousands of Latter-day Saints have thronged the mission field. In the April 2013 general conference, Elder Neil L. Andersen of the Quorum of the Twelve Apostles added his witness of missionary work and encouraged each of us to become an important part of this unfolding miracle by helping to find those ready to hear the gospel: “As surely as the Lord has inspired more missionaries to serve, He is also awakening the minds and opening the hearts of more good and honest people to receive His missionaries. You already know them or will know them. They are in your family and live in your neighborhood. They walk past you on the street, sit by you in school, and connect with you online” (“It’s a Miracle,” Ensign, May 2013, 78). Elder Neil L. Andersen of the Quorum of the Twelve Apostles, “It’s a Miracle,” Ensign, May 2013, 78. 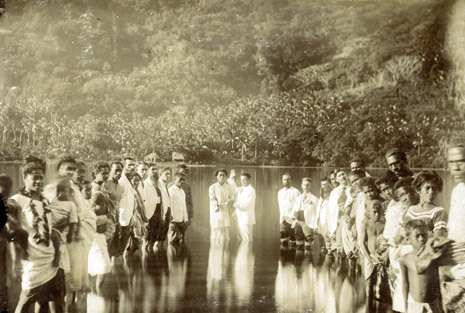 Newly arrived missionaries baptized natives in the Sandwich Islands (Hawaii) as early as 1851. This photograph dates from much later. 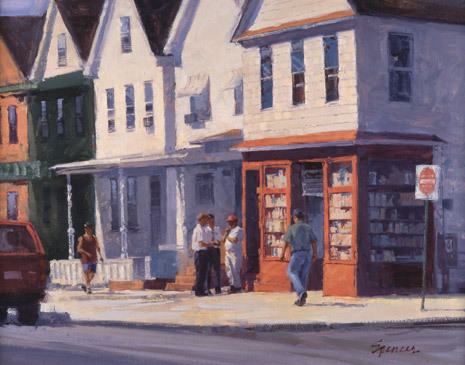 Pioneering the Streets, by Ken Spencer. These two missionaries share the gospel with a man in front of a bookstore in New Brunswick, New Jersey, USA. 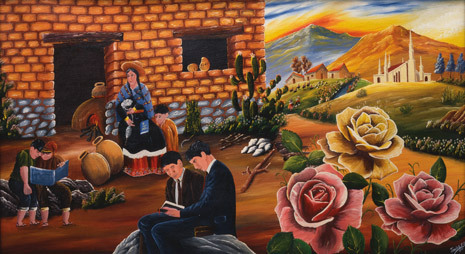 The Lamanites Shall Blossom as a Rose, by Joselito Jesus Acevedo Garcia. This image captures the spirit of missionary work among Spanish-speaking people. Two missionaries prepare to teach the gospel while people go about their daily tasks. The Lima Peru Temple, sitting amid small homes and native animals, represents the growth of the Church. 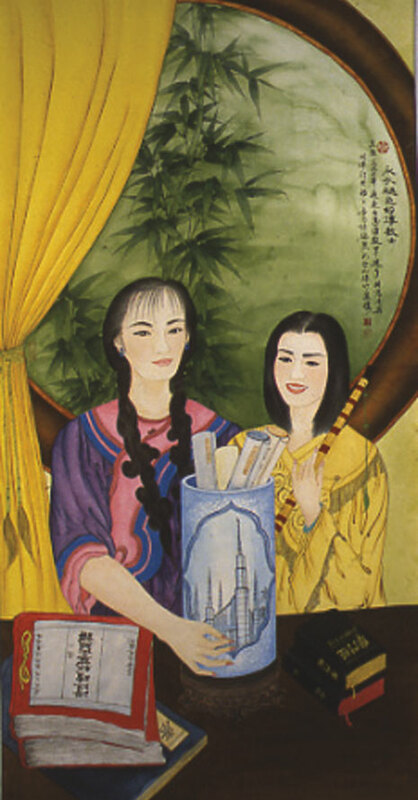 Unfading Missionaries, by Juei Ing Chen. Members of the Church in Taiwan, like member missionaries everywhere, seek to share their joy in the gospel and the scriptures. The scriptures are on the table; and the tall blue container holding scrolls features a picture of the Taipei Taiwan Temple. 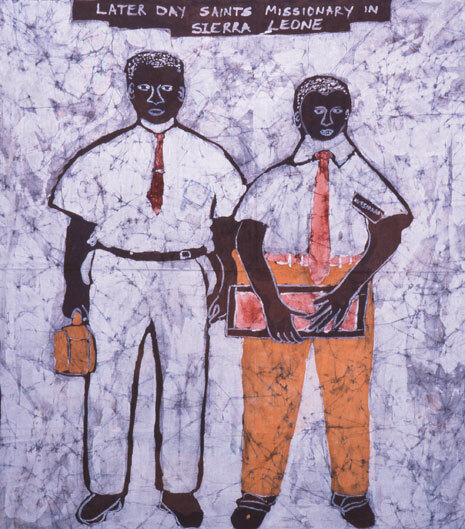 Latter-day Saint Missionaries in Sierra Leone, by Emile Wilson. The first mission in Sierra Leone was organized in Freetown on July 1, 2007. Freetown became the 3,000th stake in the Church on December 2, 2012.